No matter how much an expectant mother prepares for it, childbirth can be the messiest, scariest, and most excruciating experience for a lot of women. 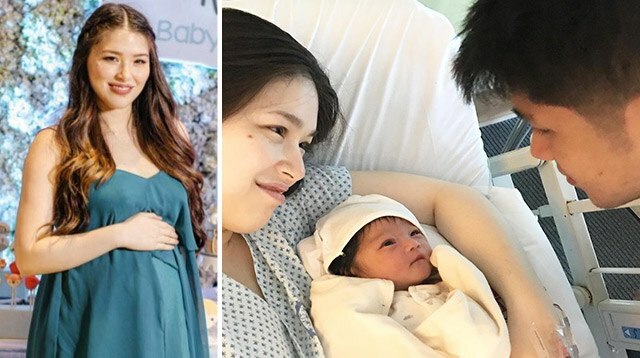 That's why Kylie Padilla, just like all moms, deserves mad props—she bravely powered through four days of labor, as Kylie's road manager, Ghee Castro, shared on Monday, August 7. The Instagram video shows Kylie's journey to motherhood, captioned with a first-hand account of what happened in the delivery room on August 4, when Alas Joaquin Abrenica entered the world. "I've known and seen Kylie as a physically strong person," she wrote. "It was the first time I saw her so weak, shaking, [and] in so much pain throughout her four days of [labor]." Kylie, along with her partner, Aljur Abrenica, originally planned to give birth the "natural" way via a water birth. This method of delivery involves zero anesthesia (ouch! ), but some women prefer it because they see it as a less intrusive and more empowering option than a normal birth. But when she finally went into labor, things didn't go exactly as planned. "Kylie's cervix did not dilate fully when they reached 8 cm, so she decided to go with [a] normal delivery," Ghee shared on her Instagram page. Nevertheless, Ghee's first-hand account showed that Kylie was a fighter the entire time. And when Baby Alas was finally born, it was all worth it—not only for Kylie, but for everyone around them. "[In] that very moment, there was an undeniable energy taking over the delivery room that I can't describe," according to Ghee. "…Seeing Alas for the first time was a beautiful moment for everyone in the room. It is true, that once the mother has finally seen her child, all the pain goes away, at least for few precious minutes."